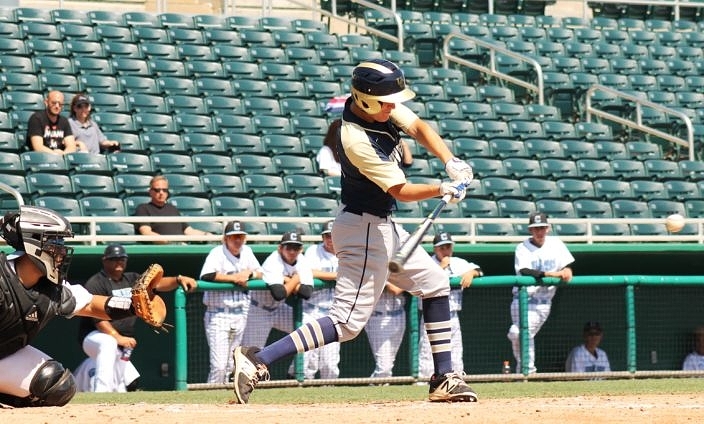 Michael Ruiz connects for a base hit for University Christian. 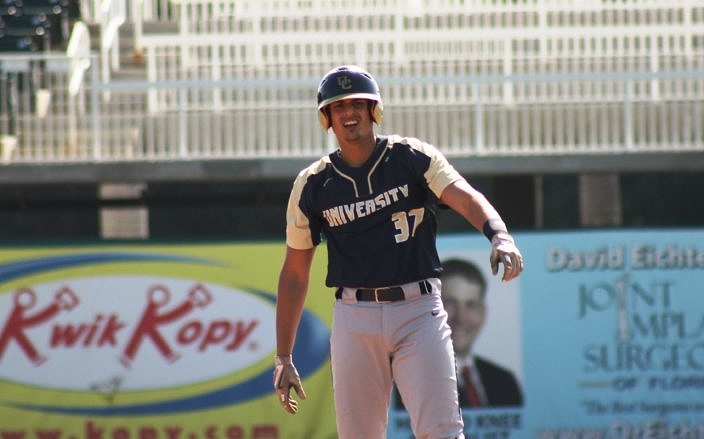 Much like it has all year long, the University Christian baseball team came to the plate for each at bat with a plan in mind and an idea on how to execute it. Starting from their first plate appearance and right on through to their final swings, the Christians made key adjustments that got the offense rolling. 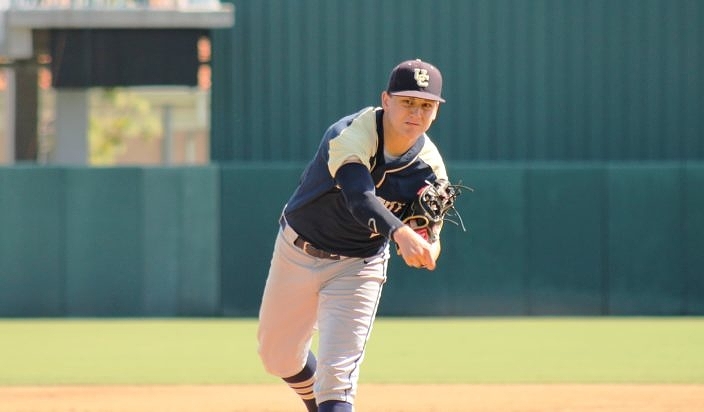 On the mound, Darien Smith battled through the entire way to do his part, as University Christian shut out Archbishop Carroll 6-0 in a 3A state semifinal at Hammond Stadium in Fort Myers on Friday morning. The Christians advance to Saturday’s state final, where they will face the defending 3A chamion Canterbury Cougars, who also advanced with a 7-4 win over Bishop McLaughlin on Friday afternoon. University Christian will be competing for its fourth state title in program history, the last one coming 27 years ago in the 1990 season. The Christians (20-8) set the tone from the very first at-bat. Lead-off man Cody Melton battled through for ten pitches, fouling off four straight after he had two strikes before connecting for a base hit to left field. Gage Dixon singled to third to advance Melton, and Alejandro Visaez lined an RBI double into the left field corner to put University Christian on the scoreboard with the only run it ultimately needed. Melton has made a living all year on taking a lot of pitches and helping the rest of the order get a look at the opposing pitcher. That trend continued from his first at-bat, and it made the rest of the batters bring a stronger approach to the plate. Junior right-hander Darien Smith tossed a complete-game shutout to earn the victory. After Michael Ruiz walked, Dylan Richman fell behind but adjusted to poke an RBI single through the right side of the infield defense. An error allowed another base runner to score on the play to make it a 3-0 advantage. It was a tough start for Archbishop Carroll ace Salvatore Lorenzo-Lugo, who exerted himself with a lot of pitches just to get through the first inning. On a hot and very humid day, the conditions only added to the challenge of settling in against the feisty Christians lineup. Much like he has all season, Lorenzo-Lugo battled through adversity to keep his team in the contest. He tossed three scoreless innings before the Christians got to him for two more runs in the fifth. Jerrett Schlachter scored on an error and Michael Ruiz executed a great suicide-squeeze bunt to drive in Paul Haskew for a 5-0 lead. Melton came in on an RBI single from Gage Dixon in the seventh to complete the scoring. Alejandro Visaez celebrates following his RBI single thata accounted for the deciding run in the first inning. Meanwhile, Darien Smith featured a deceptive delivery and precision pitches to hold the Bulldogs (26-3) at bay. The right-hander inherited a lead before his first throw, and he was dominant on the mound to make his run support hold up. Smith went the distance on 92 total pitches, and he got stronger as the game wore on. Smith retired the first 11 straight batters and finished with 12 strikeouts, while allowing just three hits and one walk. He carried a no-hitter into the bottom of the fourth, before Jonathan Leon lined a single into left field with two outs. “He just kept us guessing the entire time, and by the time we finally picked him up it was already the bottom of the sixth,” Leon said of facing Smith. Close play at first base. @darien_smith discusses the keys to his success Friday in leading University Christian to a 6-0 shutout.